We are delighted to offer a strictly limited quantity (only 50 available) of wooden presentation gift boxes. 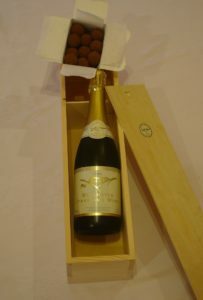 Each box contains a bottle of Wellhayes 2014 Sparkling Wine together with a large 180g traditional ballotin (containing 16 chocolates) of exclusive hand made luxury truffles, infused with spirit made from Wellhayes Sparkling wine. These presentation boxes, which make ideal gifts (or you may just want to treat yourself), are now available for only £40 (a saving of 20%), including post and packing (UK only), while stocks last. Available at wellhayesvineyard.co.uk/wellhayes-wine. Previous Previous post: Have you tried our new brandy?